“nâ” is a media art installation that visualises the manufacturing process of traditional Taiwanese indigo through projections and kinetics. In the three parts “mud”, “aqua” and “crafts”, users can first learn interesting facts about the history of Taiwanese indigo, before experiencing the installation through different gestures derived from the traditional handicraft process. They can discover how to make natural indigo dye liquid by initially pushing bubbles aside with their hands and then moving the dye plant leaves around in the liquid to dissolve the contained indican that produces the blue colour. After adding lime water, maltose or rice wine and mixing everything well, the indigo dye liquid production is complete. The “crafts” part invites users to create two unique indigo patterns through specific gestures, as demonstrated by digitisation. Users can define the colour saturation, create concentric patterns by drawing a circle and experiment with several other gestures, resulting in an individual creation that can be printed out at the end – all through a process that blends traditional craftsmanship with modern technology. The interactive art installation “nâ” is truly awe-inspiring. Featuring a projector and motion tracking, it allows users not only to discover the history and tradition of Taiwanese indigo dye liquid production and the dyeing process. It also delivers a sensually convincing, natural feel of stirring the dye liquid with its different degrees of viscosity. 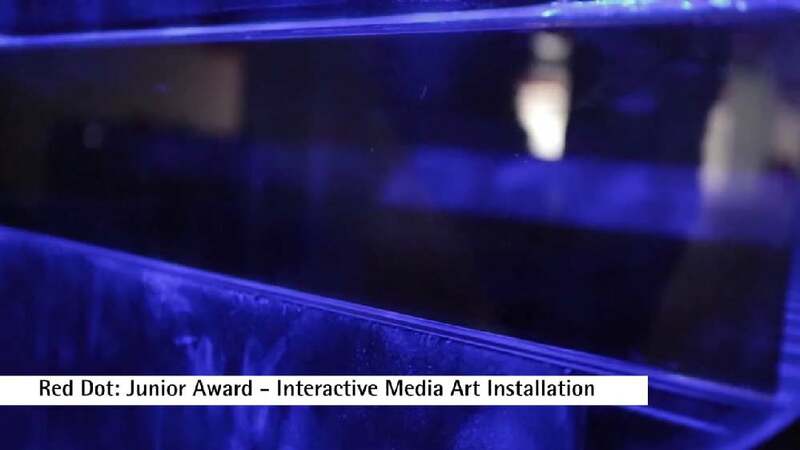 The implementation of this haptic experience is technically and aesthetically outstanding and has emerged as a highly captivating example of infotainment.